The islands of the Bahamas are known the world over for their stunning beaches, perfect weather and unparalleled beauty, making them one of the hottest holiday destinations on the planet. From the bustling capital of Nassau to the crystal-clear diving waters, it’s easy to see why so many people put the Bahamas at the top of their bucket list. But just because this archipelago is a hotspot for cruise ships and weddings, it doesn’t mean that there is nowhere left to explore. There are still plenty of beautiful sights to see and experiences to have, you just need to know where to look. Much like nearby Jamaica, the Bahamas are home to lush greenery and sparkling blue seas, providing the perfect backdrop for visitors to take off on their own adventures. So, where do you start when it comes to finding your own little piece of paradise on these stunning islands? One of the most stunning places to explore is undoubtedly Lake Rosa, a huge wetland covering a quarter of the 184,000-acre Inagua National Park. This park became the second nature reserve of the Bahamas National Trust in 1965 when it was designated an Important Bird Area (IBA) for the flamingo population of the island. The protected birds set up their nests near the lake, which is the largest salt water lake in the Bahamas. The lake is also home to a huge variety of exotic native species, such as the Bahama Parrot, the Bahama woodstar hummingbird, brown pelicans, American kestrels, tri-colored herons, and snowy egrets. The guided tours are a great way to spend an afternoon, particularly for those interested in photography and wildlife encounters. If you’re looking for a moment of jaw-dropping wonder, then head to the Glass Window Bridge on the island of Eleuthera. A strip of rock just 30 feet wide separates the deep blue waters of the Atlantic Ocean and the tranquil turquoise-green waters of the Bight of Eleuthera, creating a natural phenomenon that has to be seen to be believed. Storms have repeatedly battered this part of the island, but extensive work has been carried out by the locals to continually strengthen and repair it. It goes without saying that visiting this natural wonder will require you to be very careful! 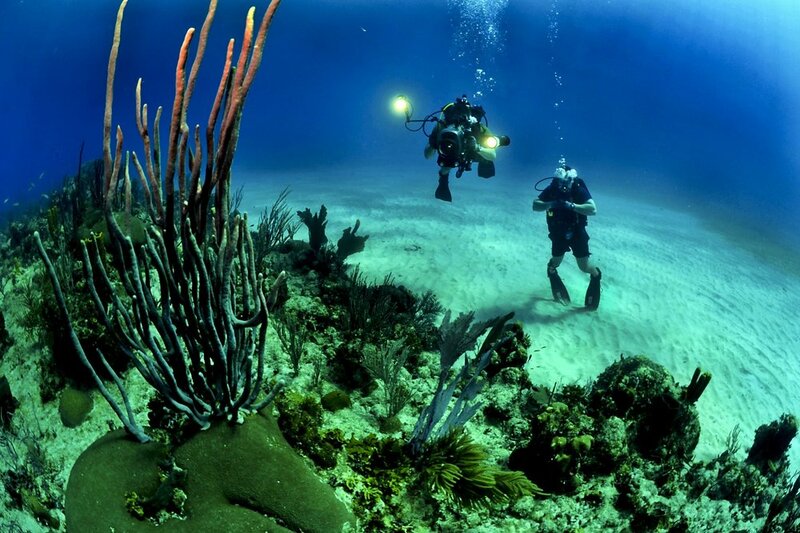 Diving is on the top of most visitors' lists, but you can still find places that are untouched. It goes without saying that there are plenty of amazing places to stay on the Bahamas. After all, it is a holiday destination! But if you’re looking for somewhere uniquely placed to give you the best holiday experience, then look no further than the vibrant Rock House Hotel. Originally built in the 1940s, this historic property has been through many transformations over the years, from a private home to a bed and breakfast, but now serves as one of the most upmarket and original places to stay on Harbour Island. Not only does it have ten uniquely decorated rooms, but it also has a pool and a pink sand beach running along the property. Whether you’re an experienced sailor or you just want to try something new, taking a trip on this 57ft catamaran will be an experience you will never forget! Sail over to the world-famous Rose Island beach to see its stunning coral reefs before enjoying a traditional Bahamian feast of delicious BBQ rib, Bahamian peas ‘n' rice, and exotic fruits. Ok, there is a myriad of amazing restaurants and stalls to choose from when it comes to eating on the Bahamas. So many places to choose from that it can be overwhelming! Which is why it’s worth knowing that you haven’t truly experienced authentic Bahamian cuisine until you have been to the Fish Fry on Arawak Cay. With a mouthwatering collection of restaurants serving up traditional Bahamian food every day, the only problem will be deciding what to have. From conch salad to fried fish, there is something for everyone’s taste buds here. However you choose to spend your time in these beautiful islands, one thing is for sure – you will never forget it!